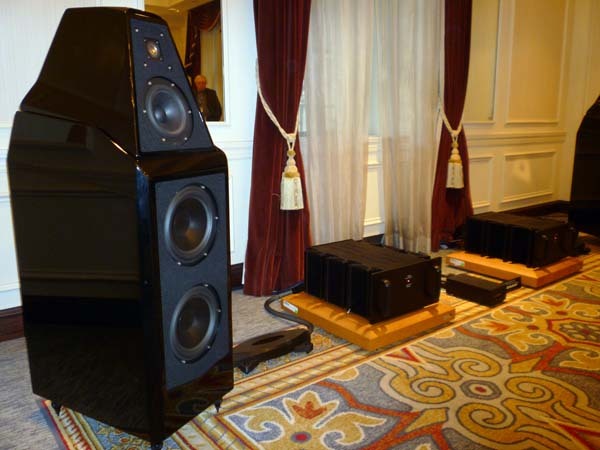 A second Innovative Audio room held a system made of Wilson Audio’s Sasha W/P loudspeakers ($27,900/pair); Lamm M1.2 Reference hybrid monoblocks ($24, 190/pair); VTL TL-7.5 Series III Reference preamplifier ($20,000) and TP-6.5 Signature phono preamp ($10,500 with moving-coil step-up transformer); Spiral Groove SG2 turntable ($21,000, with Centroid tonearm) and Lyra Kleos MC cartridge ($3000); Transparent cables, power conditioning, and AC cords; and Finite Element Pagode racks and supports. VTL’s Luke Manley cued up Nat King Cole’s “A Beautiful Friendship,” which has become one of my favorite demo tracks, and, while this system may have lacked some of the scale, soundstage depth, and eerily quiet backgrounds of the larger Innovative system, it was just as enjoyable, with a super stable stage, well-focused imaging, tuneful bass, detailed highs, and rich tone color. Loved it. 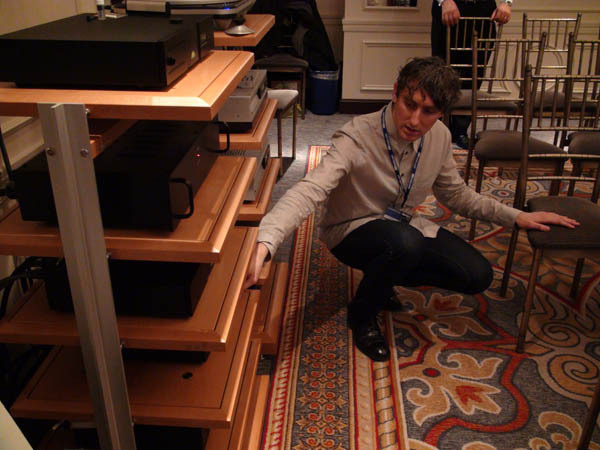 Innovative Audio Video Showrooms, a New York City hi-fi gallery hosted two rooms this year: one room with an ultimate-truth to recording digital playback system and the ultra-smooth analog room. Scott Haggart, a passionate Innovative employee and expert hi-fi demo deliverer was in the midst of a presentation upon my arrival. 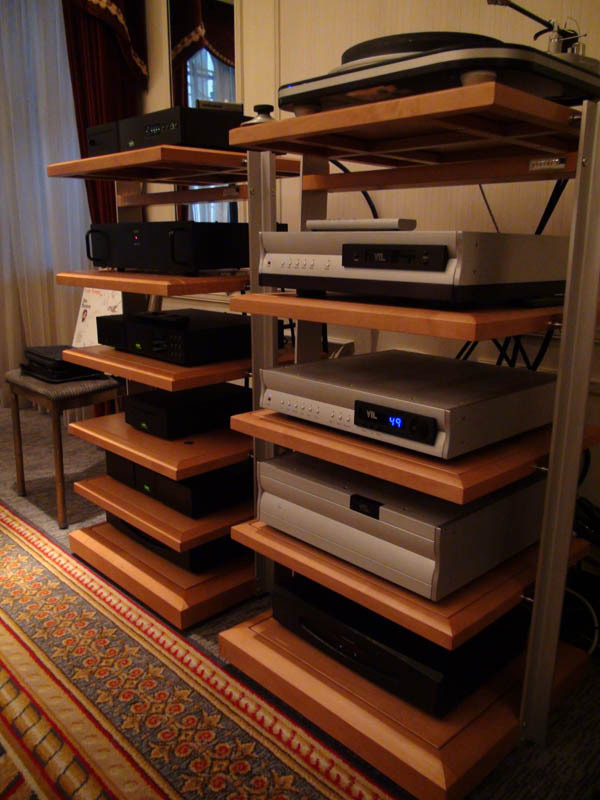 Haggart treats his work with serious care, and as anyone who has experienced one of his demos can attest to, he guides the listeners patiently through the exact gear that they are listening to and details about the music, a skill not many exhibitors at this hi-fi show demonstrated. Unsure of how this system would handle a less-than-perfect R&B recording, I handed Haggart my Billy Paul Let Em In LP. Haggart yelped, “This is filthy!” but still kindly placed in on the Spiral Groove SG2 turntable with Centroid tonearm ($20,000) and Lyra Kelos MC cartridge ($3000) after giving it a swipe with an Audioquest anti-static brush. Powered by Lamm M1.2 Reference hybrid monoblocks ($24,190/pair), the strings and vocals on this Paul McCartney cover by Philadelphia soul legend transmitted with the ultra-smooth liquidity I’ve heard a few times now from the Wilson speakers, this time with the Wilson Sasha W/P ($27,900/pair). Preamplification was provided by VTL with their VTL TP-6.5 Signature phono stage ($10,00) and VTL TL-7.5 Series III Reference preamp ($20,000). What struck me the most about this recording through the system though was the clarity of the closed hi-hat: although the two cymbals were closed shut, one could hear the drum stick cracking down and causing the two to smack together firmly on each quarter-note count. In the Lamm room, Jim Barton’s 79 Ritual Love Songs LP was spinning via a Spiral SG2 turntable (Lyros cart), Barton’s slightly tear-jerking “In My Solitude” filling the air with Mario Lanza type swashes of unadulatory vocal pleas. Lamm MM1.2s, VTL and Naim electronics, Wilson Sashas—the sound was clear, distinct, precise, even sparkly. Nice timbre. Innovative Audio’s first room had Wilson Sasha speakers, Lamm M1.2 mono amps, VTL preamp and phono stage, and Naim CDX2 digital player. 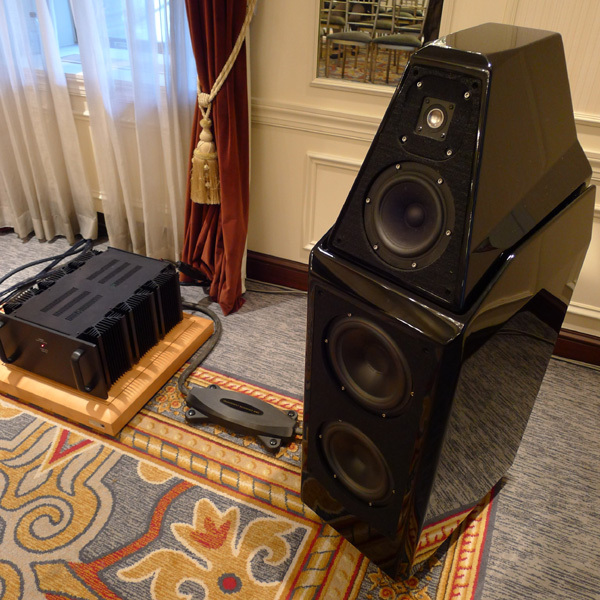 Skipping across the hall, I ducked in on a demo of the Sasha W/P loudspeakers ($27,900/pair). Driven by Lamm and VTL electronics, including the Lamm M1.2 Reference monoblocks ($24,190/pair), a VTL Tl-7.5 Series III Reference preamplifier ($20,000), and a VTL TP-6.5 Signature phono stage ($10,500). A Spiral Groove SG2 turntable (w/Centroid tonearm, $21,000), mounted with a Lyra Kleos cartridge ($3,000) was balanced by an all-Naim digital system, including a NDS Reference network player ($10,995), a CDX2 CD player ($6,195) and a UnitiServe SSD ripper/UPnP server ($3,995). Cables from Naim and Transparent Audio were used throughout. The sound from the vinyl playback (I didn’t hear the digital side) was extremely inviting, and easily among the best that I’ve heard from the Sashas. Was it Lamm? Was it VTL? Was it a (gasp!) system thing? I dunno. But I do know that the sound in here was extremely refined, even when the demos dipped into the used record bin. Old disc? Who cares. There was magic happening and I plumb forgot to take notes. Whoops, where’d that 20 minutes go? Yikes! I had places to be! Eliott Fishkin of Innovative Audio (center) sandwiched between Vladimir Lamm and his beautful daughter Esther.